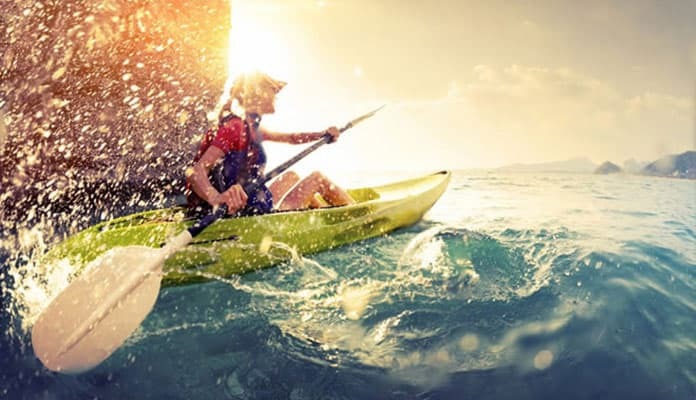 Kayaking has become a favorite sport of so many outdoor enthusiasts. With their long narrow designs, these boats can navigate through tight rivers and handle ocean surf expertly. This is why many people have begun to take their kayaks on fishing excursions. Despite their growing popularity, you can find some high quality fishing kayaks under $500. This makes fishing and weekend trips with your kayak even more desirable. Don’t be fooled by the low cost of these kayaks, they are high quality and will stand the test of the elements. Instead of costly packages, these boats will come equipped with just the kayak in mind which makes them perfect for a starter boat, or for bringing along another family member. Kayaks don’t need to be expensive for you to have a great time on the water. Choosing the best fishing kayak under 500 should be a priority. We have come up with a list of our top five below. This sit on top kayak is great for lazy days on the lake making it a great option for fishers. Made using tough UV stabilized materials the Sun Dolphin Bali SS kayak can withstand long periods in the hot summer sun without fading. This is the best fishing kayak under 500 that delivers an incredibly stable ride which allows you to be able to cast a line while standing. Built to perform in flat water this sit on top kayak navigates through the water with ease making long distance paddles even more enjoyable. The spacious cockpit is built to fit any size paddler and features adjustable foot braces and a large seating area. 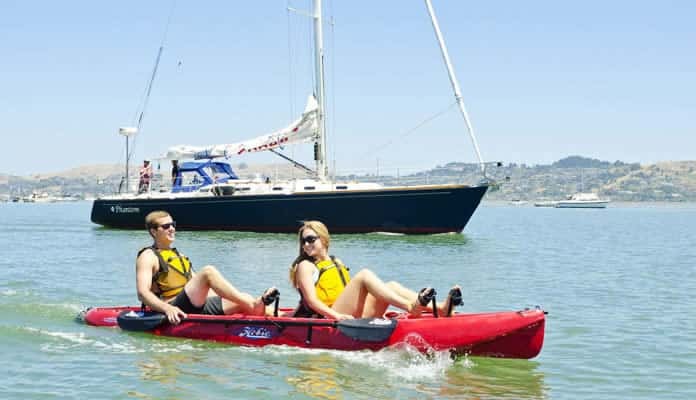 With a comfortable padded seat and protective thigh pads this kayak is built for comfort. A paddle holder frees your hands while ample storage space allows easy access to your gear. These fishing kayaks under 500 have a lightweight design with carrying handles making transportation and portaging between lakes easy. 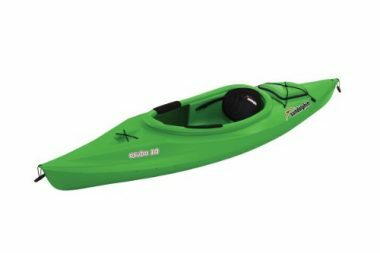 With so many features and such a low price this kayak is an excellent bargain. This fishing kayak is great for long distance paddles. With a comfortable open cockpit there is lots of room to move around and not feel claustrophobic. This Sun Dolphin Aruba 10 kayak has an adjustable high backed padded seat which will be incredibly comfortable no matter how where your journey takes you. Adjustable foot braces allow your legs to rest comfortably for any height paddler. Carrying handles make it easy to portage and transport this lightweight kayak no matter how far away from the water you park. Plenty of gear storage allows you to pack and safely store even more gear for your trip. 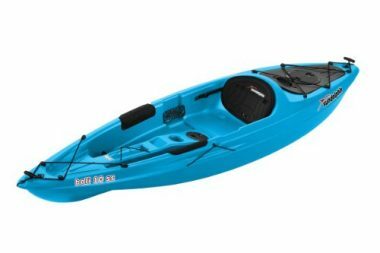 This boat isn’t just a great deal financially but with its UV stabilized materials this kayak will last you even longer. This affordable fishing kayak comes as a complete set giving you everything you need to get out on the lake. The high-end accessories that it comes with make it a stand out on our list. The Sea Eagle SE370 inflatable kayak two paddles, a foot pump, a carry bag and a repair kit, allow you to get on the water quicker and ensure there are no hidden or added costs with this purchase. Being inflatable means you can transport it in the trunk of your car which save you, even more, money as you don’t need a kayak roof rack or home storage option. This setup inflates in a matter of minutes and boasts an impressive 650-pound weight limit allowing it to hold up to three people. With a self-bailing drain valve and an inflatable spray skirt makes this kayak a great option to take into some surf and stay dry in the process. Carrying handles makes transporting even easier while two skegs make it a breeze to maneuver in the water. The hull of this kayak is sun and saltwater resistant making your money go even further by prolonging the life of this exceptional kayak. This easy to inflate fishing kayak has aluminum ribs which allows it to ride much like that of a rigid boat. The Advanced Elements AE1012-R kayak is incredibly easy to set up, simply unfold and inflate. Made of strong puncture resistant material this boat will stand the test of time and ensure you get to where you want to go no matter what the weather and water conditions are. This is a tandem fishing kayak that can also easily paddled solo as well. Fitted with comfortable and adjustable padded seats this kayak is built to handle long distance trips with ease. A dry storage compartment and bungee deck storage allows you to pack all the gear with you. This is an excellent option for a fishing kayak. This inexpensive boat works as a great starter ocean fishing kayak and will still perform well with more advanced paddlers. Truly the Sun Dolphin Excursion 10 is designed for people who love fishing, this boat comes with two flush mounted rod holders allowing you to paddle while you have a cast line. With a rear storage hatch, you can bring all your gear along with you and keep it dry and out of the way. A comfortable, padded high-backed seat will allow you to sit comfortably for extended paddles. With a convenient water bottle close by hot summer days become even more enjoyable. Adjustable foot braces make this a great option for any size paddler to enjoy while easy to carry handles and a lightweight design ensures getting to the beach is a breeze. Shock cords on the fishing kayak’s deck allow you to bring along a ton of gear. With a pure color scratches and dents are nearly invisible keeping your fishing kayak looking sharp longer. Sun Dolphin is so confident in their product it even comes with a two-year warranty. This is an excellent option for a beginner kayaker who is looking to go fishing. This kayak is made from high-density and high-quality materials. The molded kayak has enough room for you to stretch your legs out, and the seat is fully adjustable, so you can find the seating opposition which will be comfortable for those long days out in the water. 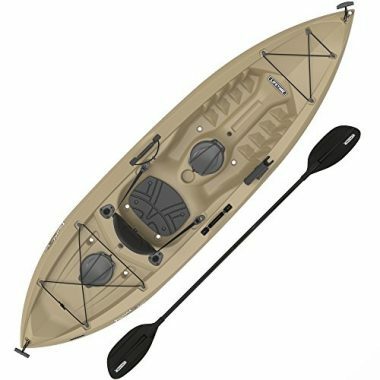 There are two 6’ storage compartments for all your fishing gear, and the front and rear handles make this kayak easy to transport. 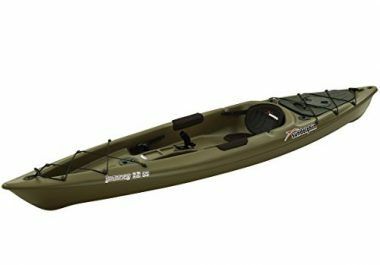 This Lifetime Tamarack Angler 100 fishing kayak is a great kayak for any fisher. It is easy to use, spacious, and comfortable. This is a great kayak for lakes and rivers. 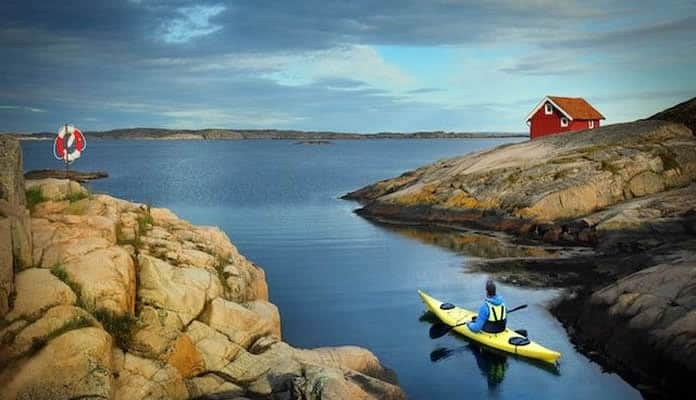 The kayak itself is light, and extremely easy to carry, allowing you to reach bodies of water which you would not be able to with a heavier kayak. When you are in the kayak and on the water, you will be able to get some good speed with this kayak and will have a lot of maneuverability. The storage compartment gives you space for your tackle, and the two rod holders give you a hands-free experience when you are out on the water. Sit back, relax, and enjoy your favorite beverage. This is a great kayak in the water. You can move to your fishing spot quickly and without disturbing the water too much. You will not scare the fish, and if you do, you can chase them down. The rod holder allows you to eat and drink with our having to stop fishing. The padded seat will allow you to be out on the water all day long without any discomfort. The seat is also fully adjustable, so you can find the position which suits you. There are many factors that make up the best budget fishing kayak. Things like the hulls material, how comfortable the seat is, and how much storage it has are all things that will affect the price of the rig. The key is to find a balance of these factors, only then will you find the best fishing kayak for the money. Taking to the water for fishing often requires quite a bit of added supplies. You also require an area to put all that supplies and keep it within hands reach of you. We made sure all the fishing kayaks under 500 on this list have ample storage so you can bring all your gear with you. All the kayaks used for fishing on our list have the stability to cast a line and reel in with comfort. They have a spacious and comfortable cockpit where you will be able to move around. The kayak will have some UV stabilization in their materials, this will allow you to kayak for long periods in the hot sun without worrying about the integrity of your boat. All while carrying a low, affordable price. You want to have some deck space for storage and for other items. If you are fishing, then it is beneficial to have some deck space in front of you to place food for lunch, tackle boxes for bating your next hook, or space to gut a fish you have caught. While storage compartments are critical to your fishing trip, there should also be some space for you to work. This is probably the thing that most fishers think about when they are buying the best tandem fishing kayak under 500. You can make do without any space, but your life will be so much easier with it. When you are looking at kayaks for fishing, you should always think about how much storage they offer. Try to calculate what you will need to take with you. Can you store all of your equipment? Do you have room for luxuries, once your equipment is stored? Can you store your equipment doing transport too? Is the storage secure? Can you add storage to the kayak? 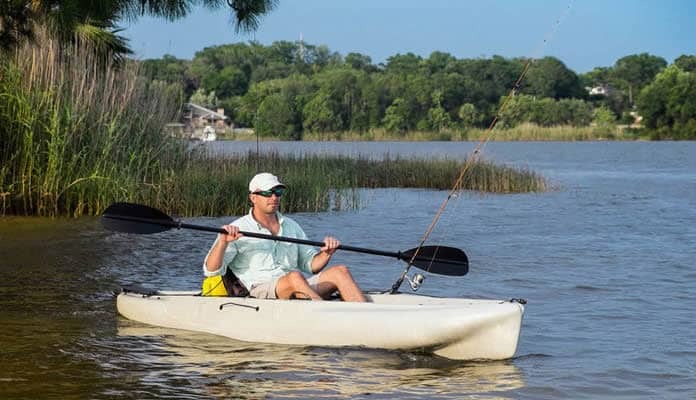 You may have to take bags with you, which will be stored on your deck, but if you can make it work, then the best recreational fishing kayak under 500 is an option. When thinking about storage, you should also look at storage for your rods too. Fishing is all about holding a fishing rod and waiting for that nibble, but holding a fishing rod for a long time can become boring instead of relaxing, and it can also take a toll on your wrist. If you have to hold a rod all day, you can add strain to your wrist. If your fishing kayak has a rod holder, then you can place it in there and have some respite, resting your wrist for a while. A rod holder will also allow you to keep your hands free for other activities. You can keep an eye on your rod, and continue to fish, as you eat your lunch. You can be processing a caught fish while you are fishing for the next one. A rod holder can make your fishing experience a lot more fun and relaxing. The last thing to think about with storage is how easy you can get into it. It would be amazing to have enough storage for all your fishing accessories, but if the storage compartment is behind your seat, then you may not be able to get into it unless you are on dry land. Make sure that you have plenty of storage, but also make sure that you can access that storage easily. It should go without saying that you need to have the capacity for your weight. 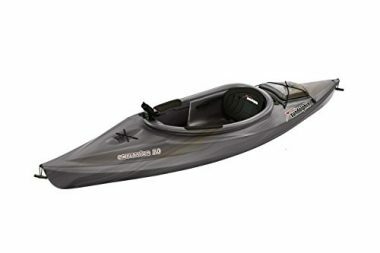 When you are looking for a fishing kayakunder 500, you should only be looking at those kayaks which have enough capacity to hold your bodyweight in the water. That is a given, but there is more to think about, which is obvious, but not often thought about at first. Your fishing kayak should be able to hold your weight plus the weight of your equipment. When you are calculating your total weight, you should add your own weight to the weight of your rods, weights, bait, containers, tools, etc. You should also take into account any food and drink you take with you. Once you have a total weight, we would recommend adding 25% to that number and then looking for the kayak with that capacity. If your kayak does not hold you and your equipment, then there is no point even going out on the water with it. There are a lot of things to think about when it comes to buying the best fishing kayaks under 500, but your comfort level may be the most important. If you are not comfortable, then you are not going to enjoy your time out on the water. Kayak fishing should be relaxing and almost meditative. So, what do you need to think about? You need to have enough room in your fishing kayak under 500. If you are tall, then you should find the best kayak for fishing under 500 which will allow you to stretch your legs out without them hanging over the edge. You should also try and find molded seats which have enough room for you to fit in them without feeling constricted. 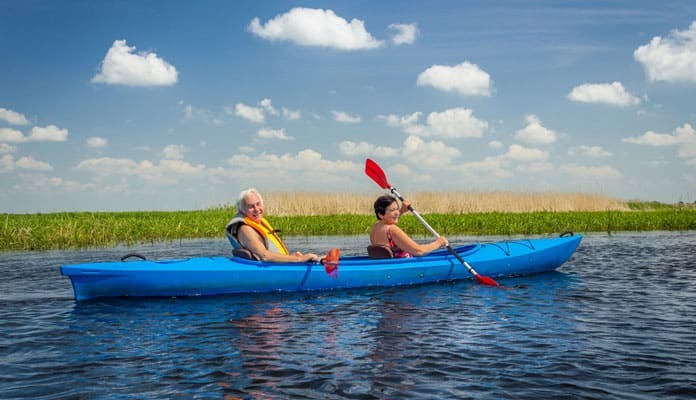 Find a fishing kayak which has the correct width and length to accommodate you. You should also look for an adjustable seat. If you can move the back of the seat, then you can find the optimal sitting position and comfort. Check what the back is made from. You want something which is soft, but firm. The back of the seat should support you when you are out in the water. If you have a seat which is uncomfortable, then you are not going to be able to sit out in the water for as long as you would like to. Comfort is the key to a great fishing trip. Always invest in your comfort, and you will come relaxed and stress-free. When it comes to any kayak, portability is important, but it is more important with a fishing kayak. If it is a long way from your vehicle to the water, then you are going to need to get your kayak there. You are also going to need to get all of your other equipment there too. If you have ever fished before, then you know how much equipment you can have with you. If you cannot get to the water with your kayak and all of your equipment, then there is no point in going. The best inexpensive fishing kayak is lightweight and easy to carry. Look for one with storage, to cut down what you have to carry in your hands. If you are going kayak fishing on your own, then you need a kayak which you can carry by yourself. As well as checking the weight of the kayak, you should also look at the way it is carried. If the fishing kayak does not have carrying handles, then it can be almost impossible to carry the kayak by itself, let alone with other equipment. Strategically placed handles will help you be able to carry the fishing kayak by yourself and be able to carry it easily. The type of fishing you want to do will determine if you want a keel, a defined keel, or no keel. You will find the keel on the bottom of your kayak. The main purpose of a kayak is to keep it going in a straight line and to allow it to move fast. If you have a keel on your kayak, then you will be able to go faster in a straight line. A defined hull will give you good speed and allow you to turn quicker. No hull will make for a slower kayak, but one which can turn very quickly. But, when would you want to use each one? If you are fishing on a large lake, there is not a lot of need to turn, but there may be a need to move fast and get from one area of the lake to another. There is enough space to turn in a wide arc, so a keel will be needed. If you want to be able to turn faster, then you can invest in a defined keel. If you are in a fast river, you may not want or need the extra speed, so no keel will be fine. This will also allow you to turn faster in the river, which may be needed with the limited space. Your choice in keel or no ket will depend on where you are fishing, and whether you are bothered about the speed and maneuverability of your fishing kayak under 500. For recreational fishing, you can make do with whatever keel you have on your kayak. Fishing comes with a lot of excitement. That moment when the fish bites at your line can cause you to jump up a little, or jump for your rod if you have it in a rod holder. You are big compared to your kayak, so any sudden movement can disturb and rock the boat (literally and metaphorically). If you hook a large fish, then it can pull at the line, and, by extension, you and your vessel. A stable boat will make it easier for you to move in the kayak, and easier to reel in those big fish when they do bite. Generally, the more stable the kayak, the slower it is and the less maneuverable. If you are looking for a boat which is stable and fast, then you may have to spend more than you are comfortable with. Of course, the level of stability will also depend on your size. People who are heavier or taller will cause a smaller kayak to be less stable. If you are a large person, then we would recommend a wider kayak. A smaller person can make do with a kayak which is not as wide. A wider kayak may be less maneuverable, but no fishing kayak is maneuverable when you are in the water. The choice will depend a lot on your size and a little on your skill level. If you are more comfortable in a kayak, then you do not need to worry as much about a more stable kayak, and can instead opt for speed. There are a lot of open waters to fish in. If you are in a lake, then you may be able to stop your kayak and not have it go anywhere. The water does not flow or move, so the kayak will stay in one place. The same is not true for fishing in a river. Rivers move in one direction, so if you stop your kayak in the middle of a river and try to fish, the kayak will likely move over time. You can also get movement on still water if there are high winds. Depending on where you are fishing, you may want to invest in an anchor. There are a few things to consider before you buy one. An anchor will add weight to your kayak, so you should ensure that the best kayak under 500 is capable of taking on this extra weight. It will also take up storage space. Do you have compartment space or deck space? If you do not, but need an anchor, then you may need to give something up. An anchor would be something which is considered at the time of buying your kayak. The other thing to think about is what type of anchor you need. You do not want to have to spend a lot of money on an accessory for your kayak, but you also do not want to buy an anchor which is going to be useless. Think about your own weight along with the weight of your kayak. Take into account the weight of your accessories, and think about how strong the water is going to be. You should also consider the terrain on the bed of the river or lake. Some anchors will be better in sand, while others will be better for rocks. Take the price into account, but also make sure that you consider all of the factors before you make your final choice. The type of material a kayak is made from will play a large role in the overall price of the kayak. Typically lighter, stronger material will increase the cost due to the more expensive material. The least expensive option is a durable plastic. This molded polyethylene material creates a rigid system that will stand up to the rough protrusions of the shore. Kayaks made from this material will increase in weight depending on how many layers are used. A glossy texture allows these kayaks to move through the water with little resistance making for an easier paddle. Since this is one solid piece of plastic repairs are hard to do and severe damage may require you to purchase a whole new boat. One of the more common mid to high range options is a fiberglass kayak. This is a lightweight option with an easily repairable hull. Fiberglass is a trusted build quality that has been used for years on kayaks. It is more delicate in that it can’t be slammed into the shore as much as the polyethylene. The most expensive option is a Kevlar material. This is the lightest and most durable material available. It is able to withstand abuse while the incredibly lightweight design will make your arms thank you. But unless you have a desire for the best of the best, this will probably not fit your budget. There are some areas that you can cut corners to save some money but your seat is not one of these. Make sure the seat to your fishing kayak under 500 is comfortable with enough support to keep you stable in rough water. If the seat is too padded, or not padded enough, you could slide around instead of having a firm spot to secure your body, especially during rough water. Due to the low cost the best budget kayak will usually not come with any accessories. This is actually a good thing as it means that the kayak is the only thing being focused on. If a company includes a whole package for a kayak this inexpensive that means that they cut corners to keep the cost down. This allows you to pick and choose the right accessories for you. We recommend a high end, lightweight paddle. This will ensure that your arms don’t tire as quickly allowing you to go on longer trips. Materials will take a regular paddle to the next level. Look for a nylon blade with a carbon fiber handle. This is an excellent combination of high-quality lightweight materials. A: The short answer is very safe. The long answer is also very safe, but we will give you more information and tell you why. Advances in technology have created stable hulls for all kayaks. The materials are also more buoyant and durable than ever. There is little chance that the best cheap fishing kayak will wear down or holes will appear. Modern kayaks are also almost impossible to tip. This is especially true of fishing kayaks, where there is more movement than just paddling. You do not have anything to worry about when you are in your fishing kayak. Q: Why Are Fishing Kayaks Expensive? 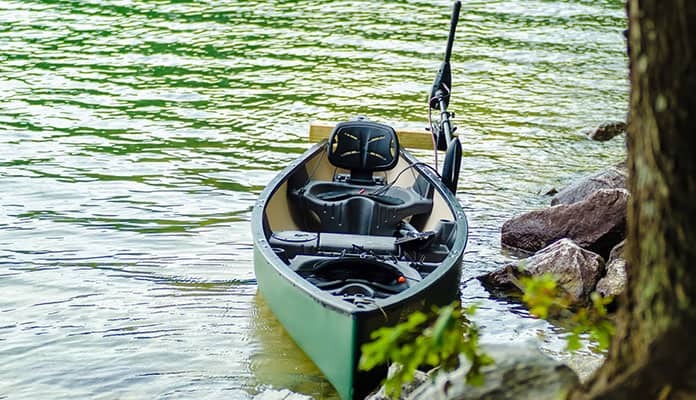 A: Fishing kayaks incorporate a lot of technology to ensure that they are stable in the water, while also offering many added features over conventional kayaks, such as storage, rod holders, and adjustable seats. With more features comes more cost. Thankfully, we have found the best value fishing kayak. This means that you do not have to worry about shelling out a lot of money. Of course, you can opt to buy a more expensive kayak, but all of the kayaks on our list will offer a premium fishing experience at a fraction of the cost. Q: How Fast Do Fishing Kayaks Go? A: As fast as you want. A lot of the speed depends on the type of kayak you have. Depending on the keel, you can have an extremely fast kayak, but with limited maneuverability. You can also go the opposite direction and be able to turn fast. The size of the kayak will also dictate how fast it can go, with the weight of the kayak being a big factor. If you want to carry a lot of weight, then you will not be able to go as fast. Of course, a lot of the speed depends on your skill, fitness, and strength. Q: Why Do Fishing Kayaks Have Holes? A: Fishing kayaks have holes to let water out, which has accumulated in the kayak’s cavities. Kayaks are not solid, and it is partly the air aside which helps a kayak to float. If a kayak was to get water inside and you had no way to let it out, then it would stay in there and weight the kayak down. With a hole, you can let the water out. When you are in rough water, you should leave the holes open. The water will slash over the sides of the kayak and run out the holes. In calmer water, you can use scupper plugs to seal up the holes. Q: What Amount Of Storage Space Do I Need? A: That depends on how much stuff you want to take with you. At your most basic, you are going to want a rod, some hooks, and some bait. After that, you need to decide if you want some extra kit, some tools to gut and process fish, a storage space for fish, food an drink, sunscreen, etc., etc. It really does depend on how much stuff you want to take on your fishing trip. You should always make sure that you have more storage space than you need, just in case, and you should also make sure that the storage space is easy to access. Kayaking is an incredibly enjoyable weekend activity. Using a kayak to fish with will allow you to get to the best fishing spots. This sport isn’t always affordable but with these kayaks make this fun activity available to more people. All of these fishing kayaks under 500 are good quality for the price and allow you to get on the water for less. Budget fish kayak reviews agree that the low price should not compromise performance and comfort. With the best fishing kayak under 500 on our list, you will get a quality boat at an affordable price. Do you have one of these kayaks? Let us know what you think in the comment section below.